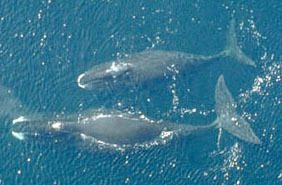 My latest post for AAAS talks about a recent study by Elizabeth Alter and colleagues who used mitochondrial DNA (including DNA from very old samples) to explore how arctic ice and whaling have impacted the breeding and evolution of bowhead whales. You can read my post here. In other DNA/whale news: Last week, Current Biology published a short article about the discovery of “the world’s rarest whale.” The discovery was actually of two whales–a female and her male calf. The two spade-toothed beaked whales (Mesoplodon traversii) became stranded on a New Zealand beach and later died. Prior to these specimens, the only evidence that this species existed came from a few bones. Sightings of beaked whales are rare because these whales spend most of their time deep in the ocean. Identification of spade-toothed beaked whales is especially tricky since they are difficult to distinguish from Gray’s beaked whales (a more common species). Kirsten Thompson and colleagues used DNA analysis to determine that the mother and calf were not Gray’s beaked whales (and that they were related). Morphological examination pointed to the spade-toothed identity. This study highlights both how important DNA analysis can be for identifying rare species and just how little we know about the species living in the deep ocean–including those as large as whales.